In a large stock pot, heat the olive oil over a medium flame. Saute the onion and white parts of the scallions until soft, about 5 to 8 minutes. Stir in the garlic and 1 teaspoon salt and cook for an additional minute. Add the stock, turn the heat to high, and bring to a boil. Simmer for 5 minutes over medium heat. Stir in the peas, sugar snaps, and green scallions, reserving 1 tablespoon of each for garnish. Cook for 3 minutes, until the peas are cooked through and vibrant. 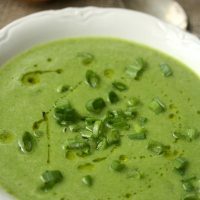 You don't want to overcook - the soup should be as green as possible. Puree using a standing blender, food processor, or immersion blender until very smooth. Taste for seasoning. Ladle the soup into bowls. Drizzle with olive oil and a squeeze of lemon. Garnish with the reserved scallions and snap peas. Soup is great warm or at room temperature.